Two Different Company of Saudi Arabia is seeking for the following position. Interested Nepali candidates may apply as soon as possible. Job Position: Driver & Beverage Juice Record. united Placement and Employment Services Pvt. Ltd., Gangabu, Kathmandu. 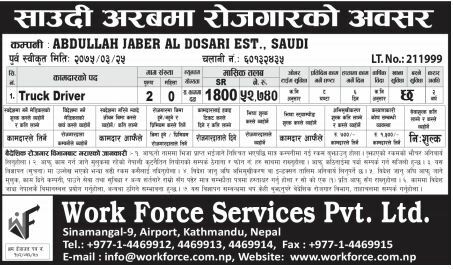 Work Force Services Pvt. Ltd., Sinamangal. Kathmandu.